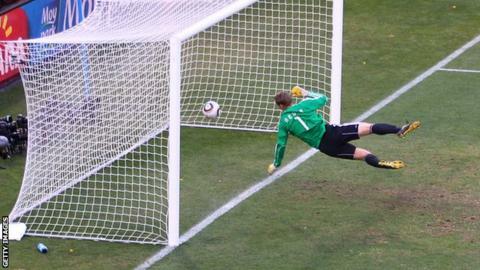 Goal-line technology is be used in a football match for the first time. The Hampshire Senior Cup Final between Eastleigh FC and AFC Totton on 16 May will test Hawk-Eye's camera-based system. Calls for goal-line technology have increased with dubious decisions marring a number of high profile games. Field tests. These will take place in a football stadium chosen by the technology system provider. Testers will conduct a greater volume of shots on an empty goal, shots against an impact wall, shots on a goalkeeper, and the sled test, also used on Phase 1 testing, where a ball is placed on a sledge and moved along the goal-line. Training sessions. A series of simulated scenarios on the field using players will assess the systems with an increased number of players in and around the goalmouth. Laboratory tests. Both systems will be tested against a variety of conditions. This will include simulating different climatic conditions (including rain, smoke/fog and heat/humidity), testing against the impact of proximity to mobile phone transmitters or other magnetic field distortions (eg TV cameras, LED advertising boards) and tests on the watches which would be worn by the match officials. Real 'live' matches. To ensure that every eventuality has been considered in the two testing phases, each company is also required to have its system tested in two separate 'live' matches. Chelsea's Juan Mata was awarded a goal that had not crossed the line in his side's 5-1 FA Cup semi-final win over Tottenham on 15 April. And QPR defender Clint Hill's header was clawed back into play via the crossbar from two feet behind the line by Bolton goalkeeper Adam Bogdan during the London club's 2-1 defeat at the Reebok Stadium on 10 March. Southampton's St Mary's Stadium is the venue for the non-league final in which Hawk-Eye will be used as Fifa continues its testing programme into the system's viability. Fifa president Sepp Blatter recently revealed that at least two goal-line technology systems have proved themselves fast and accurate. "There are now systems that combine precision, speed and are uncomplicated," said Blatter in December. In March, football's law-makers the International Football Association Board (IFAB) approved two companies - Hawk-Eye and GoalRef - to take part in the second phase of Goal Line Technology (GLT) testing. Between May 10 and the beginning of June, EMPA (Swiss Federal Laboratories for Materials Science and Technology) will rigorously assess the reliability and accuracy of each system, as well as how robust the technology is. The German-Danish-owned GoalRef will be tested in two separate matches likely to be in the Danish Superligaen or possibly when Denmark play Australia in a pre-Euro 2012 friendly on 2 June at Copenhagen's Parken Stadion. During the test matches only Fifa's independent testing agency will have access to the system readings and the system will not be available to the match officials. Refereeing decisions will therefore be unaffected. Approval for goal-line technology could arrive when IFAB reconvenes in Kiev on 2 July to analyse the second phase test results. Subject to one or both systems passing the tests the expectation is that the technology will become available to any league or competition wishing to utilise it.